Svärtad liveklubb intar Linköping och Lorient den 1a juni 2019. Avslut depicts a deformed, decayed and lost mankind. The group has its roots in Stockholm, Sweden. 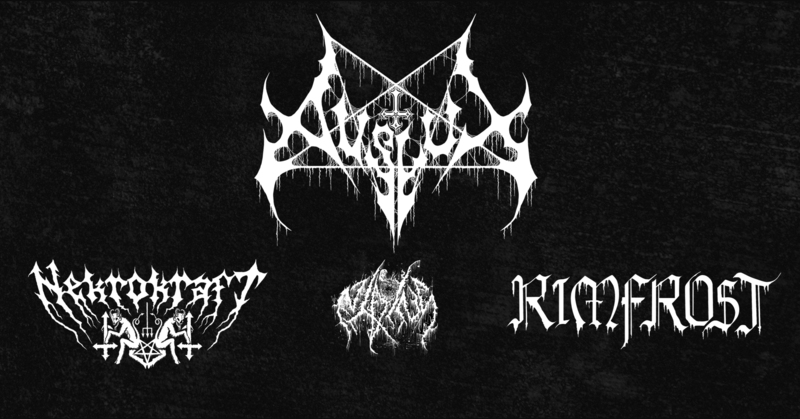 With high quality live performances of complete hatred and misery, Avslut will definitely leave a mark on the crowd. The perfect blend of atmospheric, fierceness and groovy parts mixed with the misanthropic lyrics makes Avslut’s dark art something special and pure. Avslut is nothing less than a weapon, an uncompromising passage to meet your fate. Lirar hård metal med ett jävla driv. 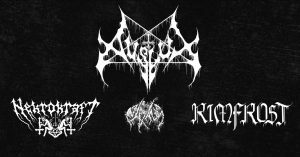 Tänk att ”Judas Priest”, ”Accept” och ”Metallica” parar sig med ”Immortal” (Norsk black metal). Då får man ”Rimfrost”. Men det är inte bara driv och köttande. I låtar som ”A clash under the northern wind”, ”As the silver curtain closes”, Freezing Inferno, Frostlaid skies mm. finns en grandios storslagenhet som får en att tänka på filmmusik. Risen from the old school scene to bring darkness and to consume the witches brew. Intoxicated blackened old school thrash meets a modern, mysterious and melodic approach with frantic vocals, blasting drums and screeching guitars. With three albums under their wings, including the new album “Servants” and countless live performances, such as Sweden Rock Festival, Black Christmass and Gefle Metal Festival to name a few, under the belt since the start 2012 Nekrokraft gives the promise of headbanging riffs and captivating groove. Nekokraft embarked on a Europe tour late 2018 and are scheduled for another one in May 2019. År 2015 reste sig black metal bandet Niding ur den mörka bittra avgrunden i Östergötland. Sedan dess har bandet med sin mörka atmosfär ödelagt allt i sin väg. Med ondskefulla riff, snabba blastbeats och influenser utav death och thrash metal är det som har format bandet. Niding har nu spelat ihop med band som F.K.Ü. , Gruesome och Vanhelgd. Niding är nu hungrigare än någonsin på att sprida kaoset och ondskan vidare.